I had a conversation recently with a mom who mentioned looking online to see what the suggested number of outfits was that she should have for her 3-year-old son. First of all, what? Second of all, her internet research told her that the answer was seven. That's all. Seven. Before you get too far thinking that I'm out spending a fortune on my kids' wardrobes, here's my secret: I buy nearly everything at a fraction of what it would cost in the store or at all the mall. That's right! Instead of spending far too much money on overpriced apparel that will be worn for one season or toys that will be passed over when the next fad comes around, I fully say no to wasting money and say yes to Just Between Friends Milwaukee. If you have never attended a Just Between Friends event before, you're missing out. These nationwide consignment sales help families and communities across the country save money and make money by providing quality items at bargain prices for kids. No matter if you arrive to shop with designated purchases in mind or simply want to browse to beef up your child's closet or pick up gifts for birthdays, the holidays and more, JBF is a not-to-be-missed sale for everyone. These bi-annual events provide exactly what you need for the upcoming season, whether that be snow pants, soccer cleats, a Halloween costume, dolls and accessories, a jogging stroller or more. I spent quite a few hours at the JBF Milwaukee sale this past spring and still can't get over the pure enormousness and variety of what was available at rock bottom prices. Every age, every color, every style, every everything! Or how about some of this? There is just no reason to buy retail when these bargains are waiting and I, for one, am giddy with anticipation for the upcoming fall sale. If you're within driving distance to the Milwaukee area (if not, you can find an event near you), then mark your calendar because you're not going to want to miss this! *Items with a star will remain FULL price! Consignors decide which items go 25% and 50%. But, wait! 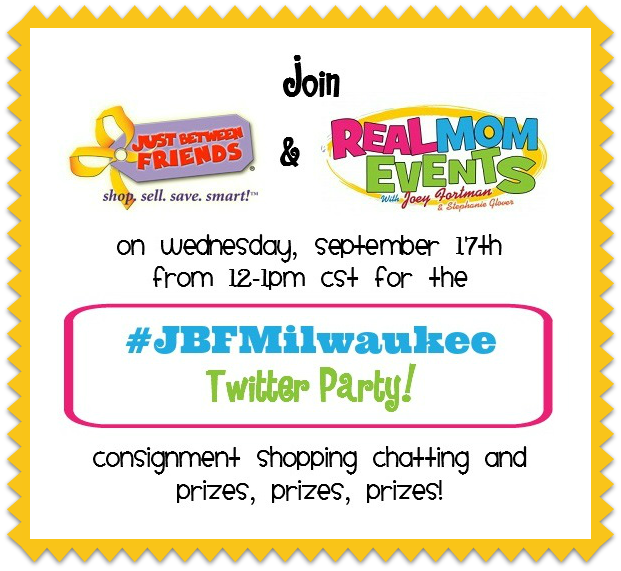 While you're making your plans on when you want to head over to shop, shop, shop at JBF Milwaukee, come join me to chat about all that is awesome about consignment shopping at the #JBFMilwaukee Twitter Party this week! Why wouldn't you want to win Front of the Line Passes and a ton of JBF Bucks?! I sure do! Head over and RSVP now and then I'll see you tomorrow at noon at #JBFMilwaukee on Twitter! In the meantime, be sure to visit the JBF Milwaukee website and connect with them on Facebook and Twitter so that you'll stay in-the-know on all of the amazing happenings and updates from this fantastic event! This is a sponsored post written by me on behalf of Just Between Friends of Milwaukee. This program is in partnership with Real Mom Media (www.RealMomMedia.com). All opinions are my own. I wish that were near where I live-I'd get my Black Friday Christmas shopping done in a heartbeat! Don't remember seeing anything like this in Denver. Too bad. Talk about the motherload of sales! That is unreal!!!!! I hope you're able to go to this. I like that it lasts a week. So, what did you find? Some good stuff? I love this! Thanks so much for coming as it was great to see you again! I wish they would offer something similar in our area! This is great.